Thanks to responses like "I really appreciate the work of the Senate Conservatives Fund and just sent them another donation" & "Senator DeMint is very inspiring! 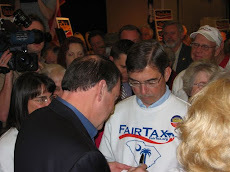 Still wish he would step up to the plate" – these are responses to the last posting that highlighted the list of 2012 Senate candidates endorsed by SC Senator & FairTax co-sponsor Jim DeMint. I hope you all checked out the candidates on this list & will support one or another of them with whatever resources you have available (time or money). What a difference it will make to have several of these people join the caucus of Senators DeMint & Coburn – especially if BO is reelected. I am equally as excited to let you know that lead House FairTax sponsor Rob Woodall (GA) has offered to help the reelection campaigns of the Members of his House freshman class that are in tough or close races – many of whom have been targeted by the statists. Rob must be in a safe district himself (thank heaven) & is offering to help his fellow freshmen Members just like Jim DeMint is doing in the Senate for new candidates. "The political attack apparatus is in high gear and is going after this freshman class in the House. These men and women who joined me as newcomers to Congress this year represent what is best about our country – they are entrepreneurs, doctors, nurses, parents, teachers, servicemen, and more. These newcomers and I are bringing reform to Washington, and defenders of the status quo attack us for it...they are ever-energized to defeat us. "Will you commit to helping me reelect some of the true heroes in this freshman class? They are in tough districts. They have cast a lot of tough votes by standing up to the leadership of both political parties and simply doing what was right for their constituents...simply click here.. .my commitment to you is that every penny that you send in response to this request will go directly into the toughest races in America this year. How important are these races? These races will decide whether Nancy Pelosi regains title of Speaker Nancy Pelosi next year. "Who do you know outside of our community – a college friend, a former coworker, a former neighbor, friends from church who moved away? Think hard…and remember everyone in your sphere of influence…and commit to giving them a call, sending them a postcard, or writing them a quick email - it could help a whole lot. Elections this fall will be decided as they always are by four, five,and six vote margins. Together our efforts could make the difference!" As many of you know Rob Woodall virtually single handedly represented & defended the Republican (Ryan) budget on the House Floor twice over the past week to ten days. I have watched his work in this regard & am tremendously impressed. He has been marvelous. No one could not have done better. Thanks to our Night Watchman we have already identified House candidate Eric Klingemann of Texas running in the May 29 Texas Primary & of course all of us in NJ know Anna Little in CD #6 running in the June 5 NJ Primary – both marvelous candidates in their own right & of course both are FairTax supporters. You can also check-out GOOOH – a non partisan plan mentioned several times on this blog over the years that identifies patriotic candidates who would be good choices to replace professional career politicians. GOOOH researches & then presents citizen legislators to serve a limited number of congressional terms – you can decide among their candidates who best fits this bill. 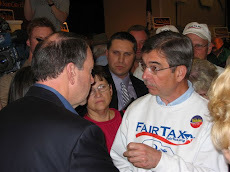 Lastly, & probably most obviously check out the list of Members of Congress who are FairTax co-sponsors – nine in the Senate & sixty seven in the House. It is so important to support those FairTax co-sponsors who deserve your support in tough or targeted districts or states. Over the past several months I have explained why all of us should find several voters (@ least three each) who most likely will support & vote for statist candidates & try to turn these voters around in their mindset to help preserve what is left of America's founding excellence. The last two postings show that we have no dearth of candidates worthy of support so we still have a chance. Make the most of it. I do hope someone is checking this site. I have a comment: "libertarian principles that America was founded upon & originally followed." I am not sure that is accurate. Just finished reading, "Lafayette in America in 1824 and 1825. Journal of a Voyage to the United States." This was written by Lafayette's secretary (a soldier)during the trip. It is translated by Alan R. Hoffman, published 2006. Throughout the book it refers to the "republican principles" on which the country was founded. Notice republican is/was not capitalized. Your comments? RTE - libertarian is the bedrock & republican is the form of government they chose. If all of the founders were not libertarians we would not be here today.